Snowball, aka Fanatic Snowball, is a 3 year old black male born May 28, 2014. His sire is Trent Lee and his dam is Fanatic Jaycee. Snowball has 13 races on greyhound-data.com between April 2016 and December 2016. 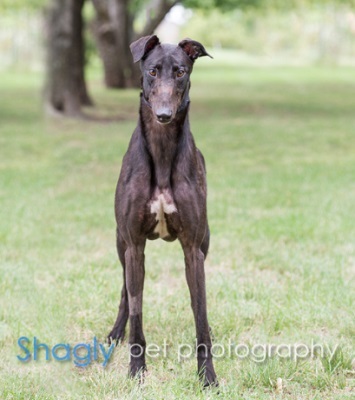 He started at Wheeling Downs in Wheeling, WV and finished at Orange Park Kennel Club in Orange Park, FL. Snowball is ready to be the new love in your life. Snowball is not considered to be cat or small dogs tolerant. Do you want to play ball? If so, Snowball is the dog for you. His favorite thing in the world is chasing a ball and he'll bring it back, or at least close, to you again and again. Snowball also LOVES water - mostly to stand with his front paws in a bucket in when it's hot! Snowball will melt your heart! 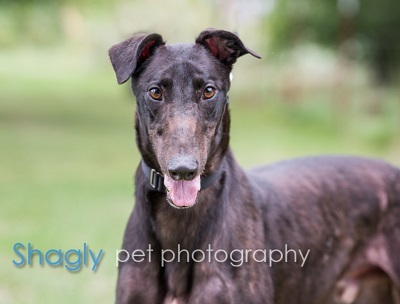 He is a handsome boy, who would love to play with you and go for walks together. Snowball has very good house manners, crates well and will greet you enthusiastically when you come home. Inside, he spends most of his time quietly relaxing in the same room with his people. If you go to a different room, he will be right behind you. He's not demanding of attention, he just wants to stay close. No kitties or small dogs please! Snowball gets along well with other large dogs and could possibly be an only dog if he has a person who is willing to play with him. If you have a big yard with lots of things to chase and people to love, his life will be complete.